Hamilton's first automatics arrived on scene in 1953 as part of the newly introduced Hamilton Illinois line. This was also Hamilton's first foray into Swiss-made grades. In 1954 Hamilton introduced the Automatic K-series line with additional Hamilton-branded models. 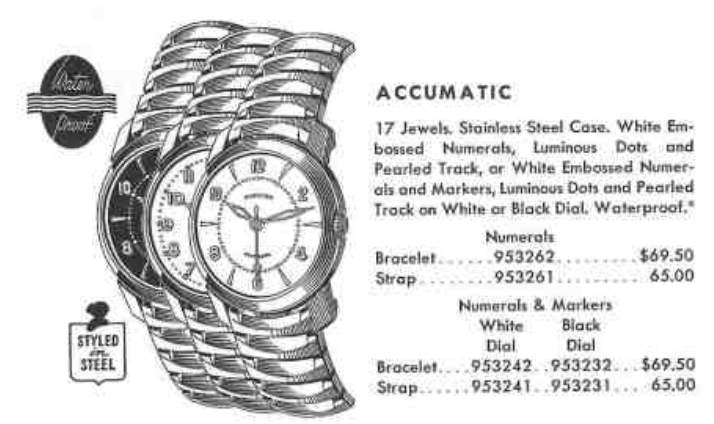 By 1956 the Hamilton-Illinois line was discontinued and a new model line called the Accumatic was introduced. The A-series of watches were produced well into the 1970s with over 65 different models. The first Accumatic model was produced through 1958. It came in a stainless steel case with a choice of three different dials. Tucked inside the case is a 17 jewel Hamilton 672 movement. This ETA-based movement was also used inside the Hamilton Illinois models. The 672 is based on an ETA 1256. The K-series watches used a K. Freres movements while the Accumatics used ETA grades. My Accumatic project watch arrived in filthy condition. In fact, it's probably the dirtiest watch I've ever laid hands on. The odd thing about this Accumatic is the case lugs don't match the catalog image. I've see Accumatics that do match and I've also seen them with this case design. So I'm of the opinion that both styles are legitimate Accumatic models. This style of case back has a pan-shaped cover that is secured with a threaded ring. I'm not a big fan of the design as they can be a challenge to open since the slots in the ring are fairly small and don't accommodate my case wrench too well. The movement inside could stand a good cleaning but it doesn't have any rust. It ticks too - so a thorough cleaning will do this watch a lot of good. Normally when you remove a nasty old crystal you find the watch looks lot better... not in this case. I'm tempted to put the crystal back on! Maybe I'll be able to clean it up but I suspect that this dial will not look "new" without being refinished. While all the parts are being cleaned I'll pick out a new crystal. Well, the dial cleaned up to leave what looks like a leather texture. I'll treat it to a "poor man's refinish" with a quick spray of lacquer to give it a wet-looking sheen. All the parts are cleaned and dried. Everything looks great at this point. The movement is reassembled to the point that all I need now is the balance. Without the oscillating weight it looks like your basic manual-winding movement. The balance goes back into place and we're off to the races, as they say. It's running a little slow but that's nothing that the regulator can't accommodate. I won't have to move the regulator too far to make of the 90 or so needed seconds per day. There... I moved it too far initially so the slope of the two lines increased too much but then I backed off just enough for the two lines to approach horizontal. With the movement back to running order, the dial and hands go back on and then the works go back into the case. A new crystal and a fresh black strap are excellent finishing touches. The dial isn't perfect but, to be honest, it doesn't look bad enough to require be refinished either. Well I managed to snag another Accumatic project watch and this one has it's proper case (note the shape of the lugs) and it has the all-numeral dial shown in the catalog image. It arrived in very dirty condition but it was working, which is always good. And here it is after it's trip to the spa. My camera makes it look a little rougher than it really appears in person. It's actually a nice looking watch.